April 1 – Puerto Vallerta in Mexico will be the venue for the Concacaf Beach Soccer Championship, scheduled to take place May 13-19. 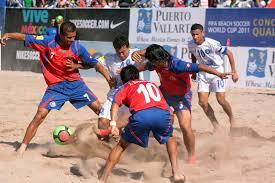 The 16-team championship will qualify both finalists for the FIFA Beach Soccer World Cup Paraguay 2019. That competition is scheduled for November 19-December 1. “Bringing a World Cup qualifying competition to Mexico is very relevant, in many aspects, including the support to our local teams, the promotion of a tourist destination that offers great attractions such as Puerto Vallarta and this modality of the most popular sport in our country, without leaving aside the economic benefits and the quality of the sport that promotes healthy coexistence among Mexican families,” said the Mexican Football Federation President Yon de Luisa.